In northern India, on the border of Tibet and Nepal, tucked away at the base of the Panchachuli mountain range is a growing cooperative of village women weavers called the Panchachuli. This cooperative is a product of Indian visionary Mukti Datta’s efforts to transform the lives of women living near the Binsar Forest at the base of the Panchachuli Mountains. After witnessing how little these women were being rewarded for their laborious work in agriculture, livestock and housework, Mukti decided that it was time to find an alternative source of income for the women that would simultaneously protect the forest and improve the women’s living conditions. 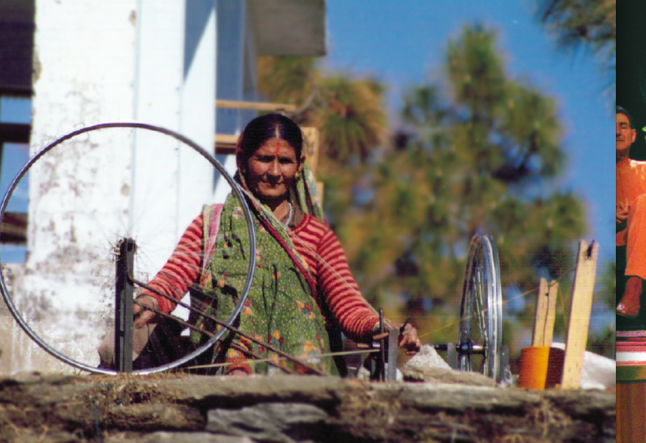 Thus the idea of the Panchachuli weaving co-op was born. The Panchachuli cooperative came into existence in 1990. Today over eight hundred women from a total of thirty-two villages in the region are involved in the processing of raw materials, and the production of high-quality woven and knitted products. The main weaving center is in Almoa, where around 300 women from surrounding villages work. The Panchachuli women weavers use sheep and merino wool, in addition to pashmina and silk – all of the wools are woven and knitted by hand, and only natural ingredients are used in the dyes. Part of the success of the Panchachuli women weavers can be attributed to the Danny Kaye and Silvia Fine Foundation and Jan Jagaran Samiti, a non-profit organization that has worked on reviving the traditional handloom in Almora and Pithoragarh districts of Kumaon since 1988. Together these foundations worked to cover part of the cost for raw materials and processing machines, as well as building a daycare center and a hospital in the vicinity. In addition to these organizations, the German charity Panchachuli e.v. was founded in 2002, peaking worldwide interest in the plight of the Panchachuli women weavers. The Panchachuli Women Weaver’s cooperative provides economic and social independence for women in the Indian Himalaya using the traditional arts of weaving and knitting. The project has given the women an alternative way of earning income and has contributed significantly to the structural development of the Kumaon region. Today, the women weavers are an interest group with a say in their own lives as well as a political influence in matters that are going on around them. The sale of all products by the “Panchachuli Women Weavers” such as 100% pashmina shawls, stoles, wraps, and triangular shawls, support the economic and social structure of the entire region.